The state of New Columbia. Yesterday, the voters in the District of Columbia were given the opportunity to decide if they wish to become the 51st state in our union. According to the voters in the District of Columbia they voted 79% in favor of a petition requesting that Congress vote to permit Washington DC to become the 51st state. Yesterday DC voters said that they want (1) the State of New Columbia to be recognized by Congress as the 51st state in the union; (2) the approval of a state constitution; (3) the approval of the boundaries of the proposed new state; and (4) approval of elected representatives for the new state. The approved petition will now be taken by the DC mayor to Congress with the hope that it will be presented on or before Inauguration Day for consideration. DC voters who do get three electoral votes have no representation in Congress. They hope that will change and that this petition for statehood is approved. I have never had a great love affair with the news industry. I can never understand why the news is generally laden with all the horrific things going on in the world and they sometimes can tuck a “feel good” story somewhere in the broadcast to justify that it’s not all bad news. Why don’t we hear more of the good that goes on in the country and the world? Years ago, when we lived in New Jersey, our clock radio was set to a news station. I hated that before my eyes were even open for the day, I was bombarded with everything that was wrong with world and very little that was right. After hearing all the “news” I had little desire to even get out of bed and start my day – why bother? The world is a miserable place. News reporting, in the present day, leans toward the sensational more than the factual. It seems to be the running fervently toward the “most sensational”, “most bloody”, “most outrageous” story. Our modern day news reporting in this country generally bears far more resemblance to the supermarket tabloid front pages of my younger days than to the noble art of journalism. 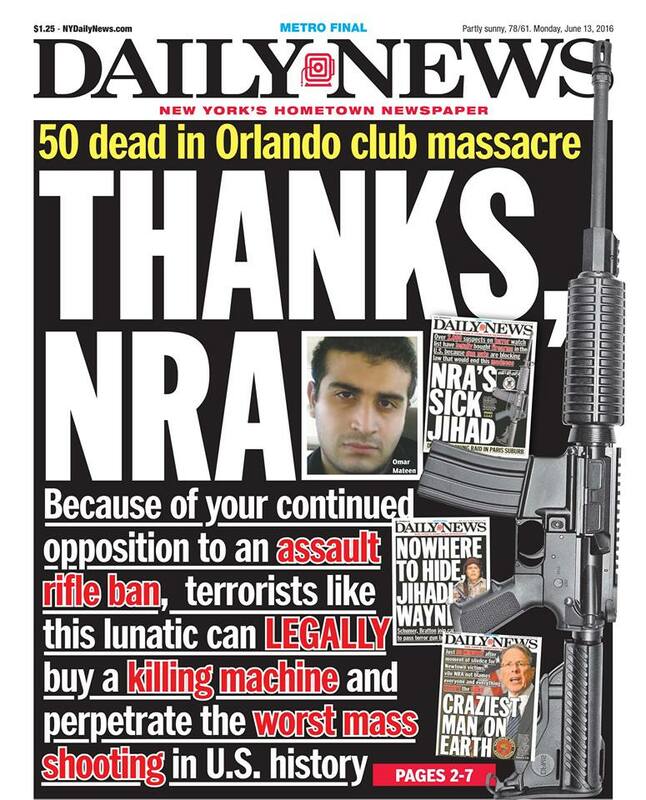 To that end, there were a significant number of of major newspapers in this country which ran various pictures of the person who was responsible for the Orlando shooting in yesterday’s front pages. His face was plastered across the news media outlets online and on television. I have a real problem with this. Why is his photo gaining this type of attention? This is not a manhunt, he is dead, therefore, no one needs to be “on the lookout” for him, no one needs to know what he looks like so he can be identified, captured and held accountable for his actions. There is absolutely no need, in my opinion, for the attacker to be personalized, for his name to spoken or written or his image flashed across the front page of newspapers and television screens. He gave little thought to the faces of the those that he killed, those that were injured, those who survived the deceased and whose lives will never be the same. Why does the media need to give him an identity and publicity? Give his cause publicity? Why was he not referred to as a “nameless, faceless” attacker? Why do media outlets feel the need to personalize him, to prop him up on the podium of front page news, giving him not only a picture, a name, but also a background, a story? There were interviews with his parents, interviews with those that knew him, why? He is a criminal, he is a barbarian, he does not deserve that media recognition. The publicity he receives, in my opinion, serves to only ignite others like him, who see that they also may be “celebrities” in their death for their cause, gaining front page access to major American newspapers. His name should not be mentioned, his face should not be shown. He did not do anything that earned him that honor. There are many true heroes, good individuals who do noble things who will never, ever in their lifetime earn the distinction of their photo on the front page of the New York Times or any other major American newspaper. Their stories and their faces will never receive that journalistic honor and distinction. Yet, a person who horrifically and cowardly struck down innocent people who were caught by him inside a building earned that villain this distinction. Our society is fundamentally flawed, when our news media believed that showing his picture and telling his story was a better “scoop” than the hundreds and hundreds of people who stood in line to donate blood to the injured that day, or the gofundme campaign that raised a million dollars for those victims and their families in record time due to the donations by thousands of people or the local businesses and organizations that came out to provide food and drinks to those trying to help or waiting for news or the first responders who worked tirelessly to retrieve and treat the injured and identify the deceased so that their families would know the answer to the terrible question – did my loved one survive? The faces of those that were gunned down by a maniac didn’t get their pictures on the front page the day after the shooting, even though some of their identities were known at that time. Innocent people died simply for being in the wrong place at the wrong time, yet those people didn’t earn the distinction of front page news like the loathsome creature that slaughtered them. That, my dear friends, is just a small part of what irks me about news media and the way our society’s values lie. Along with the many other changes that need to come from this horrific incident, perhaps maybe news organizations won’t give acknowledgement to those miscreants and their organizations, further fueling their fires. I can only hope. This is one of the new labels that you will most likely see if Vermont’s GMO labeling law successfully avoids legal challenge and goes into effect as planned just about one year from now on July 1, 2016. The Vermont Attorney General’s office last week released the rules regarding the labeling of foods produced with genetic engineering that will guide manufacturers and producers of genetically engineering products for sale in this state. 2. Packaged foods with genetic engineering offered for sale in Vermont including packaged raw agricultural commodities as well as processed foods. 6. Foods verified by a qualifying organization – such as food certified as “organic” in accordance with USDA National Organic Program accreditations. 7. Food for immediate consumption such as unpackaged foods served in restaurants. 8. Medical food as defined by federal law. The entire set of rules adopted by the Attorney General can be found here. On Monday, the Federal Court denied the Grocery Manufacturing Association’s request for a preliminary injunction to stop the enforcement of the law beginning on July 1, 2016. This was a positive result for Vermont, the “david” in this david versus goliath battle. Vermont is the first state in the nation to pass and put into effect a GMO labeling law and opponents of the law were quick to file a complaint in federal court seeking to have the new law invalidated. This request for an injunction was the first step for the opponents to see if they would be able to have the court order that the law could not go into effect until the litigation was finalized. While this was rather important and justifiably was splashed across the news around the country, not many reported that there was a second part to that ruling. While the opponents were seeking to have the court grant injunctive relief, the state of Vermont filed its own application seeking to dismiss, at least in part, the opponent’s claim. Vermont was predominantly unsuccessful on it application to dismiss various claims. For example, in response to the opponent’s claim that the labeling violates First Amendment rights, the court ruled: The court believes that Act 120’s affirmative labeling requirement is not barred by the First Amendment, but denies Vermont’s motion to dismiss the First Amendment challenge because the court recognizes that this is a serious question of law as to which courts might disagree; but the court finds that Act 120’s ban on the term “natural” does violate the First Amendment. The court did dismiss the opponent’s claim that the labeling law violated the Commerce clause stating that the Act’s affirmative labeling law did not violate the Commerce clause since the labeling requirement only applied to products sold in Vermont. The court in its ruling was skeptical of some of the plaintiff opponent’s claims of a constitutional nature, but since this was a preliminary application, the court was reluctant to outright dismiss the plaintiff’s claims as a whole. As has happened many times in the past, all eyes will continue to be on Vermont as this law and the legal challenge to it unfolds. We have all heard the stories and perhaps, sadly, even know of people who are forced to eat cat food or dog food because they cannot afford human food. But have you taken a stroll through your local pet food store lately? The food is not inexpensive and the ingredient lists read like menus from your local restaurant. Trying to raise awareness about the diets of humans and pets, one pet woman is pledging to eat only pet food for 30 days. Dorothy Hunter, the owner of Paws National Pet Emporium in Richmond, Washington believed that the products she sells folks for their pets are actually better than human’s processed foods, so much so that she’s going to eat that herself. It started when she just grabbed a bag of treats off the shelf while she was working and gave them a taste. Stating that the treats were pretty good, she thought this was something she could do. Watch and listen as this lady explains ….. She is journaling her diet every meal on You Tube. Here’s an interesting story. A 42-year-old California electrician’s shoulder came into contact with 14,000 volts of electricity. His optic nerve was affected by the burst of electricity. About a month after the incident, the man was complaining of vision problems and his ophthalmologist examined him and found something remarkable. The man had star shaped cataracts in both eyes which were a result of the optic nerve damage. The doctor, an ophthalmology professor at a California university said that the incident is unusual but not unheard of. Evidently, damages from electrical burns in animals show up initially as small bubbles which eventually turn star shaped. As for the electrician, the cataracts were removed and new lens placed into his eyes however due to the damage to his optic nerve his vision has been detrimentally affected. You can read more about on Livescience or in the January 23rd issue of the New England Journal of Medicine. Article first published as ITunes May Owe You Money on Technorati. Wouldn’t it be great if ITunes gave you money instead of you forking over cash? If you purchased an ITunes 99 cent gift card to purchase songs for $1.29 on or before May 10, 2010, you might be looking at some extra cash. A class action lawsuit brought by the law firm of Onder, Shelton, O’Leary & Peterson LLC on behalf of ITunes customers who purchased a gift card advertising 99 cent music are eligible to receive a one-time ITunes store credit. The credit in the amount of $3.25 will be given to all eligible customers who have completed an ITunes Class Action Lawsuit Online Form. Although the firm is in the process of emailing potential class members, you don’t need to wait to receive the email in order to claim your part of this class action settlement. A class action settlement is a lawsuit brought by one or more plaintiffs on behalf of all those persons who are similarly situated. 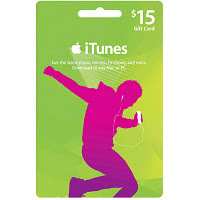 In this case, the plaintiff alleged that the gift card, which stated that if one purchased and used the gift card, a person would be able to purchase songs at the ITunes Store for 99 cents each. The lawsuit contended that in April 2009, Apple raised the prices of certain songs to $1.29 and refused to honor the 99 cent gift cards. Unlike most other lawsuits, there is no minimum age for claimants in this litigation since it is believed that most of the users and purchasers of the ITunes cards in question were children, teenagers or college students, who might otherwise be ineligible to make a legal claim. If you would like more information on the background of the litigation please visit the law firm’s news release.